While water-loving hippos are not commonly associated with Namibia, the hippo population of Namibia is estimated at around 1300 animals – mostly resident in the rivers of the Kavango and Caprivi regions in the far north-east of the country, a few small groups can be found scattered further south where suitable habitats occur. The name hippopotamus in itself refers to the watery habit of these creatures and stems from the Greek expression meaning ‘river horse’, which also refers to their ability to travel at considerable speed in the water and on land – about 30km per hour. 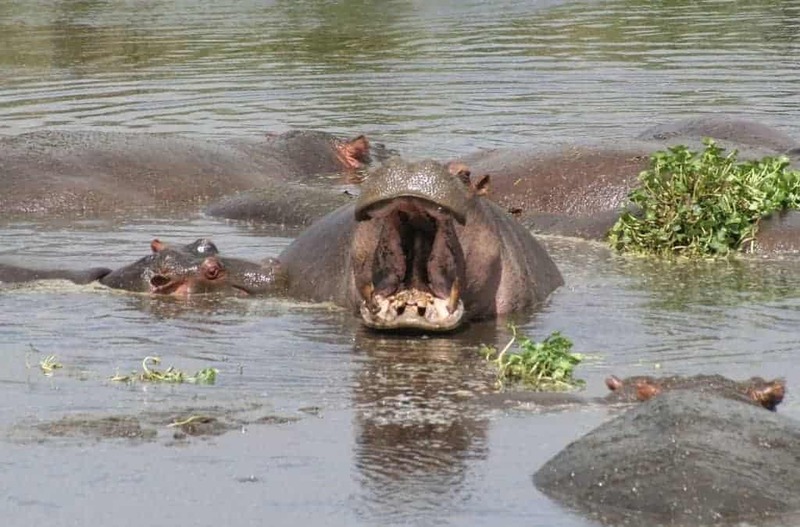 A hippo out of the water should be avoided at all costs as they can become extremely aggressive and are known as one of the most dangerous animals in Africa. Their average body weight is 2.5 tons and they stand about 1.5m tall at the shoulder. Hippos are not often seen on terra firma during the daylight hours, but emerge from their watery realm every evening to graze on the river banks, travelling up to 10km a night in search of the 130kg of green grass that they require daily. Daylight hours are spent in the water sheltering from the hot sun, where they float about in groups, called pods, consisting of cows, sub-adults and calves, with a dominant bull. Most pods have between 5 and 10 members. Male hippos are exceptionally territorial, threatening all rivals with hostile displays of their massive ivory tusks, which can grow up to 30cm long, and fights among male hippos are a common occurrence. Hippo cows give birth to only one calf after a gestation period of 240 days. The little ones are born in the water amongst dense reed beds and can swim within seconds. Newly born calves get to spend about two weeks of quality time alone with their mothers before joining the pod, as they are often killed if introduced too soon. Hippos can remain submerged for up to 30 minutes, and baby hippos suckle under water, starting to graze at the age of just 3 weeks. Another interesting fact about hippos is that they produce a reddish-coloured skin secretion called ‘Hipposudoric acid’ and the orange-hued ‘Norhipposudoric acid’ which are effective anti-bacterial and sunscreen agents. These acids create the impression that hippos ‘sweat blood’ and give hippo milk an unusual pink tinge. Namibia’s hippos are currently under threat from the ongoing drought and plans are afoot among conservationists to provide them with water, either by drilling boreholes or relocating them to places where conditions are more favourable.